Corythucha ciliata, C, Ulmui, C. arcuata, C. sp., Stephanitis sp., Kalmia sp. Adult lace bugs are about 3 to 6 mm (1/8″- 1/4″) long with a netlike pattern on the wings. In addition, the wings are dotted with brown and black. The immature stages, called nymphs, are similar except they are smaller and often have spines. The eggs, although small, are easily distinguished by their elongate and cylindrical shape. They resemble small black smoke stacks attached to the undersides of the leaf. Lace bugs are in the order Hemiptera, family, Tingidae. Sycamore, birch, elm, alder, hawthorn, willow, oak, cherry, walnut, linden, poplar, ash, broad-leaved evergreens, many deciduous trees and shrubs are common hosts. Lace bug damage is first noticed as yellow spots on the upper leaf surfaces of affected plants. Lace bugs actually feed on the undersides of leaves with their piercing-sucking mouthparts, but because they kill surrounding cells as they feed, they cause the yellow spots to appear on upper sides of the leaves. The first yellow spots that appear are very similar to mite damage, but the spots made by lace bugs are much larger. When feeding damage becomes severe, the leaves take on a gray blotched appearance or can turn completely brown. As lace bugs feed they produce brown varnish-like droppings that spot the underside of the leaves. 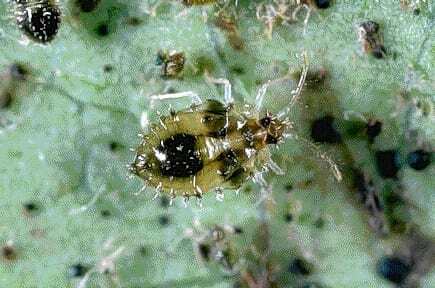 These droppings further distinguish lace bug damage from mite damage. When large numbers of lace bugs are present cast skins can be found attached to the leaves. On deciduous plants, adult lace bugs overwinter in protective places on the host, such as bark crevices and branch crotches, or on the ground in leaf litter. They end their hibernation just as spring growth starts. They attach their eggs to the undersides of the leaves often along the mid-ribs, sometimes covering them with a black varnish-like coating. The eggs will stay attached to the leaves long after they have hatched and can be recognized by noting if the tops have openings. The nymphs complete their life cycles quickly and one to several generations can occur in one season. Usually, there are two generations. Some lace bugs can complete a generation in as few as 30 days. On broad-leaved evergreens, lace bugs overwinter as eggs on the undersides of leaves. Eggs hatch in May. Two or more generations may occur during the growing season.